I loved our October this year: it was a summer we didn’t have! I did experience some cognitive dissonance reading everybody’s Top N Fall Fragrances lists but I consider it a small cost for the most beautiful weather we had. I still manage to wear my favorite perfumes more often than targeted “twice a week” but some of those wears were done in parallel with something new being tested (and compared). 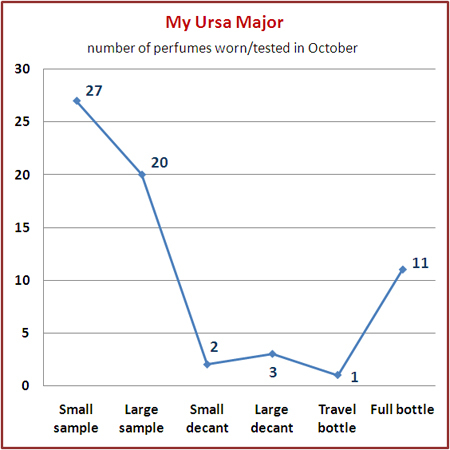 In October I tested much less new perfumes. It means that the amount of untested samples in my collection keeps growing. In the attempt to stay in control of those multiplying samples I imposed a rule: no testing is done unless a sample is entered into the database. What can I say? I had 12 of those as of this morning… and now there are 17. I swear they procreate! There are several reasons why I test less new perfumes. First, during this month I wore several favorite perfumes that required the commitment: they just kept going and going on my skin. Luckily for me I love them. But they do not leave any room for a meaningful testing of new scents. * Perfumes longevity of which prevented other perfumes testing: Ormonde Jayne Ta’if , Thierry Mugler Angel, Le Labo Rose 31 and Teo Cabanel Alahine. Did you wear recently any perfumes that claimed your undivided attention for the whole day? SL:s De Profundis and Mona di Orios Oud – I’m completely captivated by those outstanding creations. I haven’t tried yet any of these two but I will keep it in mind that they are tenacious for when I test them. I was surprised to find how long Bottega Veneta lasted, and the SSS scents last quite a long time on me, too. On Friday I wore SSS’s Rose Musk… I applied it around 9 a.m. and 12 hours later I still couldn’t test anything else on one of the wrists. Amazing. Iris, ylang ylang, sandalwood, vanila and musk. Those are some of my favourite notes too! In terms of longevity it was probably Ginestet Botrytis lately, which has all the tenacity one would expect of “noble rot”. Vanessa, how did you come across this brand? I haven’t heard about it until you’ve mentioned it here. Did you write about it? You know I’ve been consistantly wearing my full bottles lately and it really is a satisfying experience. It makes me feel a lot better about my collection! I can definitely see why it was your New Year’s Resolution, I hope to keep it up. I used up the last of my sample of Annick Goutal’s Ambre Fetiche this morning and it lasted all day, just getting better and better. I am definitely considering at least a decant – wonderful stuff! Don’t buy a decant. If you won’t go for a FB, I plan to buy one soon and I’ll send you at least 10 ml decant to help while you’re thinking if you need more. Thanks Undina, that would be great!